Reworkings of the old tales of the Matter of Britain present authors with a difficult challenge - how to weave disjointed, uneven and inconsistent fragments into a sustaining whole? Crossley-Holland triumphantly devises a structure in his 'Arthur' trilogy which transcends that problem of fragmentation. In Part One (The Seeing Stone) and now in Part Two (At the Crossing-Places) his main narrative does not concern the legendary king but an Arthur growing up at the end of the twelfth century in rural Shropshire. 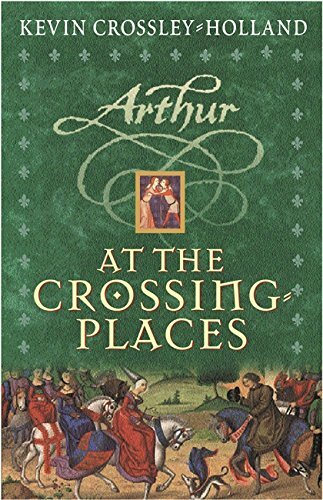 This Arthur is indeed 'at the crossing-places'. He has become squire to a knight determined to go on a Crusade, he is increasingly anxious to discover the identity of his mother from whom he was separated at birth, and he is rapidly becoming aware of girls - betrothal, after all, might not be far away. Much like many of his readers, he is testing the limits of his sense of self. King Arthur, along with the round table, the knights, the ladies, Merlin and the rest are glimpsed by the medieval Arthur in his mysterious 'seeing stone'. Here in short chapters we might find a retelling of Sir Gawain and the Green Knight, the tale of Sir Pellinore and the Yelping Beast, or the beginnings of the tragedy of Guinevere and Lancelot. Within the strong and continuing medieval narrative, these intespersed tales work well. For they are not arbitrarily introduced; they might echo or foreshadow young Arthur's experiences, helping him make sense of his life through story. Crossley-Holland's reader will have to work hard to make these connections, for these are not obvious parallels. Much of that reader's pleasure might lie in the manner of the telling, as well as in the content of the tales. Crossley-Holland invests the language of the brief chapters of Arthurian myth with a sense of otherness. Readers will need to change pace, to allow the imagery to work on their minds' eyes. In the descriptions of a hunt or a journey, there might be echoes of the rhythms and alliterations of Old and Middle English verse to be relished. This is storytelling of subtlety and nuance and, for the reflective reader, all the more satisfying for that.